To eliminate toxins including harmful heavy metals from your body for up to 10 hours, turn to natural herbal foot pads or patches like our BodyPure 2x foot patches. 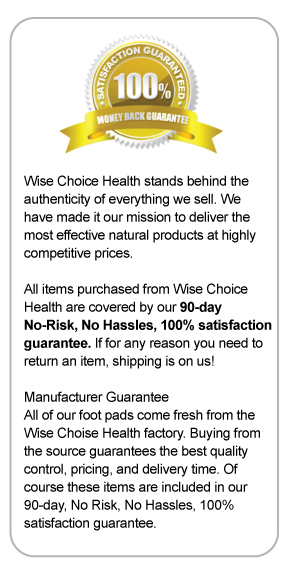 Easy to use and made from 100 percent natural ingredients, these are the same foot pads the Japanese depend on for relief from fatigue, better circulation, stronger metabolism and more restful sleep. They help improve the immune system and your ability to fight off diseases and conditions too. To stay clean and healthy, using foot pads is a sensible general practice, and these BodyPure 2X pads have twice the active ingredients of others on the market, making them work better for you. This product is proudly made in America and comes with a risk-free guarantee from the manufacturer. Even better, when you buy THREE boxes of 10 foot pads, you’ll receive a FREE gift: a CTS Used Pad Analysis worth $15. We recommend wearing a detox patch for 8 to 10 hours during the night. Then, simply throw the patch away in the morning -- or send it to be tested. Repeat every night, alternating which foot you apply the foot pad to for 10 to 30 days. See included instructions for details on how to properly apply a patch. We understand if you’re skeptical about how a foot pad can have any real effective. Once you try it, you’ll see and feel for yourself the benefit. But here’s how foot pads for detox work: The central anterior of your foot’s sole is connected to the liver, kidneys and spleen. Don’t believe that? Cut a clove of garlic open (if you aren’t allergic to garlic) and rub the cut side on this part of one foot for about 45 seconds. Within only a few minutes, you’ll taste garlic in your mouth, proving the connection. If garlic can get to your mouth that way, toxins can get out in a similar manner using the natural pathways and channels inside your body. Consider how trees draw up nutrients from the ground and expel through their leaves. This is a similar process. Natural herbs in Body Pure 2x foot pads interact with toxins embedded in tissue to remove the toxins from your system and safely lock them away. 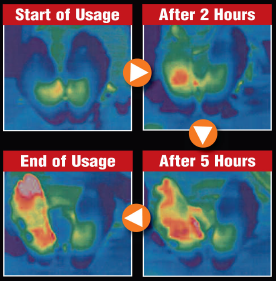 These foot pads emit far infrared energy that enhances cell function, stimulate the Kidney 1 Meridian and help you get rid of the things in your body that shouldn’t be there. Simply put, these pads perform a similar service to an accupuncturist or acupressurist, but they last 8 to 10 hours, not just a few minutes. Plus, you get a “minus ion” effect from the wood vinegars in the patches, another positive effect that helps speed secretion through the pores. So where’s the proof? Analysis under a syncrometer detects the substances on used pads that have been removed. 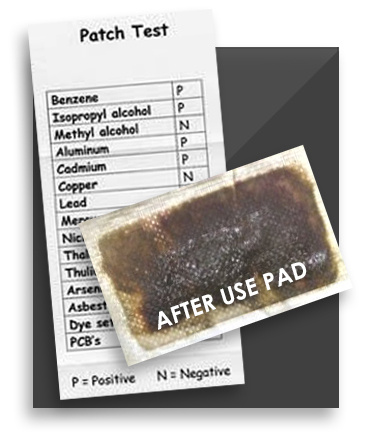 Pads have shown removal of methyl alcohol, aluminum, benzene, lead, copper, mercury, asbestos, arsenic, dyes and more. Hair analysis proves similar results. So what are you waiting for? Take advantage of proven Body Pure 2x foot pads today -- and start down the pathway toward better health and wellbeing. "While I slept, that small pad was really working! It painlessly sucked toxins out of my body. My clean white bad turned nearly black! Take a look for yourself. Here's the pad BEFORE I put it on my foot and here it is the next morning. That black stuff is moisture and toxins that came out of my body in just one night!!"